When starting or trying to grow a business, many entrepreneurs overlook the power of blogging as a marketing tool. An up-to-date and relevant blog can be your most effective and high-converting marketing tool. Not only do blogs bring more traffic to your site, but they also help to convert visitors into leads and establish your business as a trusted source within your industry. If you don’t have a blog for your business or are looking to re-energize your current blog, follow these tips for making the most out of blogging for your business. There are several ways that blogs drive traffic to your website. To begin with, every time you post to your blog you are adding one more page that is indexed and can return results for search engines. Therefore, adding more blog posts increases the likelihood that your page will appear on (and at the top of) the search results page. Frequent updates and posts to your blog signal to search engines that your site is active and should be checked regularly. Blogging also creates more opportunities for you to reach social media audiences. Every post you make has the potential to be liked, shared, retweeted, and so on. The more times this happens, the larger your audience will become, which should equate to more site traffic. You can also draw from your posts to create your own social media content, saving you time when trying to create content for all of your social media sites. There are many different types of content you can share on your blog, but some have proven to be more effective than others in driving traffic to your website. The two content types that are most successful at driving traffic are “How To” articles and infographics. How to Articles – How to articles are very effective in driving traffic to your site because there are endless options for topics. They also have great potential to include long tail keywords, which search engines love. How to articles provide value to your potential audience and quickly turn them from visitors into loyal followers. When people realize they can go to you for reliable help in solving issues they are facing (exactly what how-tos are designed to do), they are more likely to check back with you in the future and to share your information with friends, family, and colleagues. Let’s take a look at a successful how-to article from VitaMedica, a leader in the health and wellness space. In this how-to article, VitaMedica addresses a topic that both current customers and new visitors are interested in. By focusing on a topic that has a lot of search volume, it is more likely that they will draw visitors to their site who are searching for this term. With higher search volume comes more competition, though, so it is usually more difficult to rank your blog post for a highly searched term. Just something to keep in mind when choosing your how-to article topics. Infographics – Infographics have become extremely popular because of their ability to take complicated ideas or topics and explain them in a quickly digestible visual way. Infographics are shared, viewed, liked, and linked to more than any other type of content. In fact, according to Hubspot, infographics are liked and shared three times more than any other type of content, demonstrating just how powerful infographics are when it comes to driving traffic to your site. This next example comes from SmartMove, a division of TransUnion. While SmartMove has a wide selection of infographics, let’s take a look at their most recent infographic. The purpose of an infographic is to visually represent data to make it easier to digest the information rather than just reading it. While the information in this infographic could be put in a simple blog post, it is easier for the reader to understand the data when it is represented in this fashion. With blog posts generating higher volume traffic to your site, the next step is to convert those visitors into qualified leads. To do this, you should include at least one call-to-action (CTA) on all of your posts. Your CTAs should include some kind of offer to the site visitor that will encourage them to submit their contact information. These offers can include anything from free templates, tools, eBooks, how-to guides, white papers, etc. – really anything that you can offer that provides even a small value to the visitor will help convert more of your traffic into leads. Two highly effective types of content that help convert traffic into leads include white papers and webinars. Whitepapers – White papers are an effective way to create demand for your product or service without being pushy or using high-pressure sales tactics. 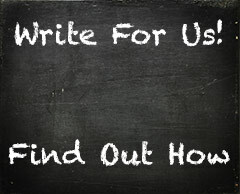 The purpose of a white paper is to provide an in depth look at a particular subject that is related to your industry. It allows you to show your potential customers that you have extensive industry knowledge and can address the questions that they want to be answered. This warms the audience up to both your product and brand before the sales pitch ever begins. A great example of how to effectively use white papers to generate leads is from DocuSign, an e-signature software company. In this white paper, DocuSign goes into detail on how to solve common HR problems by doing paperwork digitally. Before they offer up the high-quality content to readers, they require that the visitor input some information. This allows them to generate leads in return for in depth information on topics potential customers are looking for. Webinars – Webinars offer potential clients a great opportunity to engage with your company in a more personal way, helping to create an emotional connection to your brand. By hosting webinars, you give attendees the opportunity to ask questions and get a better understanding of how your product or service can benefit them. Having these personal interactions not only helps to create a connection with potential customers, but it also helps you and your company get better insight into questions, concerns, and issues your target audience is facing, which allows you to create other types of content that are both timely and useful. Our final example comes from Fi360, a financial software company. Fi360 lists all of their previous webinars and gives users the opportunity to not only download a recording of the webinar but also the slides presented. While it is helpful to have potential customers join the live webinar so that you can answer any questions that they may have, it is important also to allow users to access the recordings if they cannot make it at the scheduled time. By answering common questions that your target audience has, your blog can become an effective tool for establishing you as a credible and reliable resource in your industry. When your company has high-quality posts that answer questions, explain issues, or offer other valuable information, then potential clients will refer back to your blog on a regular basis. Furthermore, your sales team will have a highly effective way to respond to client questions and give them something they can easily reference over and over again, even after the sales contact has ended, which in turn keeps your brand at the forefront of their minds. Your blog is an essential part of creating an effective marketing plan. Your blog can increase site traffic, convert traffic into leads, and establish authority. By creating strong blog content in a variety of ways and adding great call-to-actions, your blog will quickly allow you to attract and convert more leads, ultimately benefiting your bottom line for a fraction of the cost of many other marketing tools. To understand this feature first, you need to know what it is. Instagram Live videos don’t restrict you to a limit of 10-seconds videos like Instagram stories and videos, but you can broadcast live video session for up to an hour. Instagram Live is an incredible channel to gain followers on Instagram fast and engage with them, as well as it helps you with your larger business goals. Until recent updates, Instagram Live videos are just gone when you end your broadcast but now you have the option to share your Live Broadcast Video for next 24 hours, or you can just discard it. It is entirely up to you. How to Use Instagram Live for your Business? After knowing what Instagram Live is, your next question would be how you can use it for your business. Well, to answer that I am going to share with you all Instagrammers how you can use Instagram live for your business. Live Question/Answer Sessions: You can use Instagram to engage your followers and reach your targeted audience by using Instagram Live sessions. You can use this feature by starting interactive Q/A sessions in which you can answer all your followers’ queries that they ask in a live video right away. It is the best way to increase your engagement with your audience by interacting with them. Behind the scene tours: Another way to use Instagram Live for your business is by starting behind the scenes tours. People love to watch what is going on behind those curtains especially behind the curtains of businesses. This increases the authenticity of your business in the eyes of your viewers. You can show people how you add final touches to your products, show them how your team works behind the scene, you can show them how you train your trainees for a workout, behind the scenes of photo shoots, etc. Event streaming: If you attend any event that is related to your business or if you have your event going on, you can live broadcast it on Instagram to engage your followers who don’t get a chance to attend that event. It will increase your number of viewers on your Instagram Live and helps you reach your target audience. Your presence there and your commentary on the live event make your live session more interactive. Use Instagram Live for a class, tutorial or demo: Instagram Live can be used to show your customers how your products and service work through your live tutorial and demos of your newly launched products. It means businesses can host live video classes to teach their customers how to use their product or service. It will help you highlight your product features and boost sales for your businesses. It can also be used to host Live Instagram classes. For instance, makeup artists can host live video sessions for makeup classes or tutorials, etc. So, you see there are many ways to use Instagram Live for your business. You just need to be creative in making your Live sessions more interesting, interacting and engaging to make full out of this Instagram’s feature. Why is it Useful for Your Business? The next question I am going to answer is why Instagram live is useful for your business. For that, I would say that Instagram Live is another best way to engage your followers with your business. It helps you become discoverable to your targeted audience. As according to Instagram algorithm the more your stories and posts are engaging the more are the chances that your post will reach your targeted customers feed, same is the case with your Instagram Live Videos if you succeed in driving ton of engagement and viewers on your Instagram Live video, you will end up on the explore page of Instagram, and you will be able to expose your business to more people, gain followers on Instagram fast and convert them into your potential customers. Instagram live is the place to build up your trust relationship with your followers. It will help you boost sales for your business. You can broadcast whatever you want to for your customers, but make sure to make your Instagram Live engaging enough to make full out of this. This was all about Instagram Live. So, if you are running your business on Instagram, I would suggest you do check out this feature and make full use of it if you haven’t had the taste of this yet. Good luck with and happy broadcasting! How to Serve SSL in WordPress for Free! An SSL is a method of encrypting information shared between two computers. That way anyone trying to look at the data being transmitted, won’t be unable to make any sense of it. It will be encrypted using a very complicated mathematical formula. It’s one of the most secure method at this time, and is extremely difficult to decrypt. Not until they can figure out how to make quantum computers work better at least. Google has also acknowledged that having an SSL is part of their ranking factors for websites. It isn’t a ton of SEO boost, but anything that helps rank the entire website is always good when it doesn’t require a ton of work. We are going to be setting up a free Cloudflare account, updating our nameservers, and installing two WordPress plugins to complete this task. They allow us to use their SSL certificate, so it will not be required to buy one. 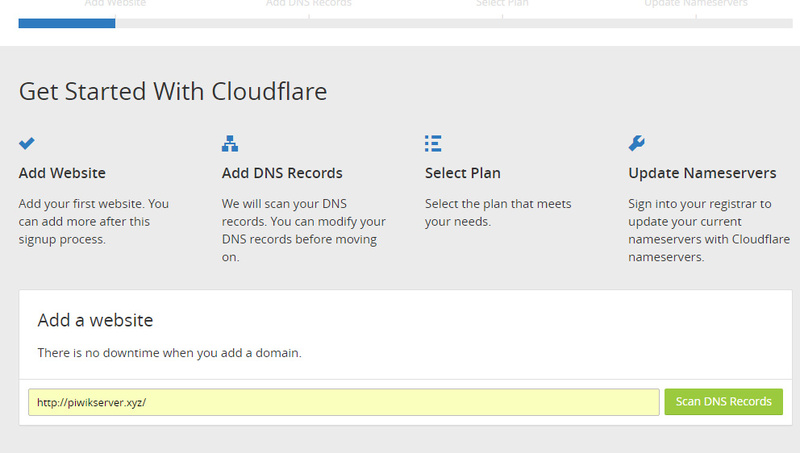 You will need to create a free account with Cloudflare. It only takes an email and password to create an account, and you won’t need to verify the email address. After you enter in the account information, and it has been created. It will ask to scan for your website for its DNS records. 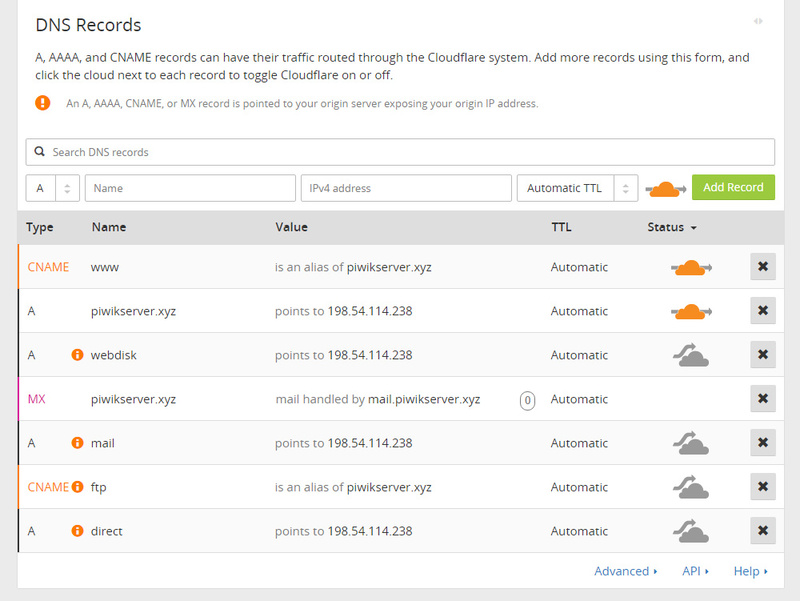 Cloudflare will be giving us two new nameservers to update on our end after the scan is complete. Note: The website needs to be hosted and live at the time as well. The above DNS Settings is how I’ve been setting up my personal sites with them, though the default settings should work just fine for you. 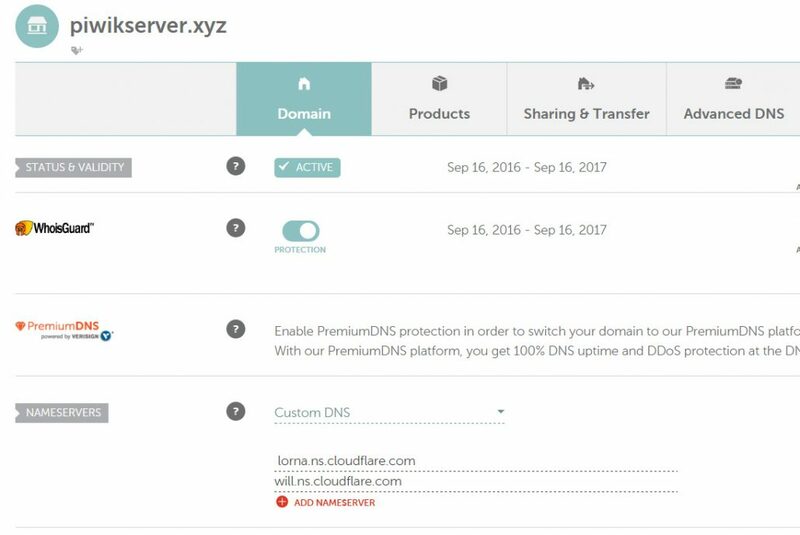 Cloudflare will assign you two new nameservers to replace the current ones in your domain registrar. Go ahead and replace the old ones, and let it update. These two plugins are not 100% required but are recommended for WordPress users. They can make life easier by preventing any headaches from happening. For the Cloudflare WordPress plugin, it will ask for your API key and email address. You will find the API key under the settings tab. Click on your email address in the upper right to find the dropdown menu. You will want to use the global API key for this plugin. Copy and paste this key into the app’s API text box. The only thing you will want to make sure of with insecure content fixer is that http_X_Fowarded_Proto is selected. If SSL isn’t live yet when you install the plugin, it may not automatically select it. 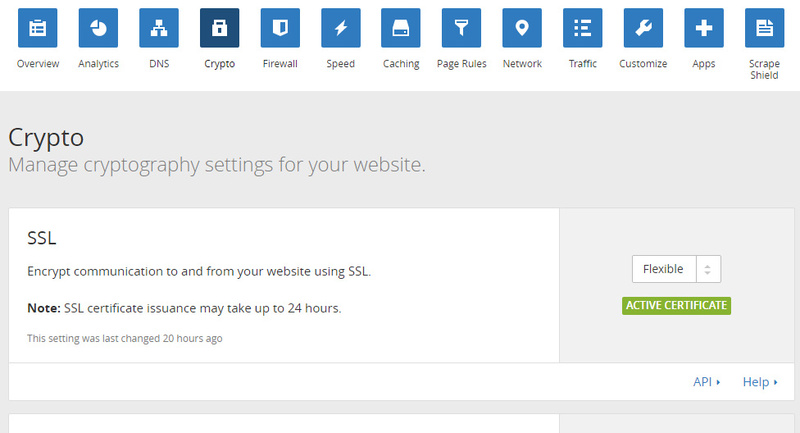 After CloudFlare becomes active on the site, you can go into the Crypto settings in your account. You will want to be using a flexible SSL – this is because it does not require an SSL certificate for the origin server (where your website is actually located at). Scroll down to the bottom of the cryptography page, and turn on automatic HTTPS Rewriters. 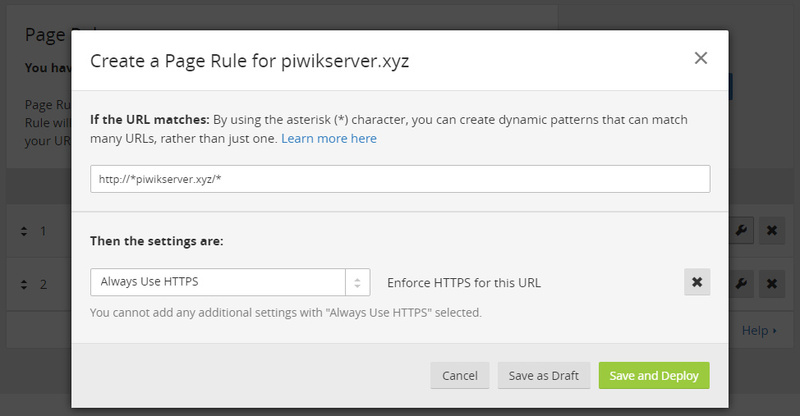 You will only need to create a one-page rule, and that is to forward all URLs to be served in https. The * are a wild card, so this will setup an SSL for your sub domains on this domain as well. Along with any URL, that is using your domain name. NOTE: If Cloud Flare isn’t “active” yet, the always use HTTPS option will not show up. Save and Deploy this Rule. Give it a couple of hours to update and do its thing, but the next time you visit your site. Go to http://domain.com without the S in HTTP. When the page is fully loaded, it should have redirected and be serving all pages in HTTPS. If you have any questions, feel free to leave a comment below.